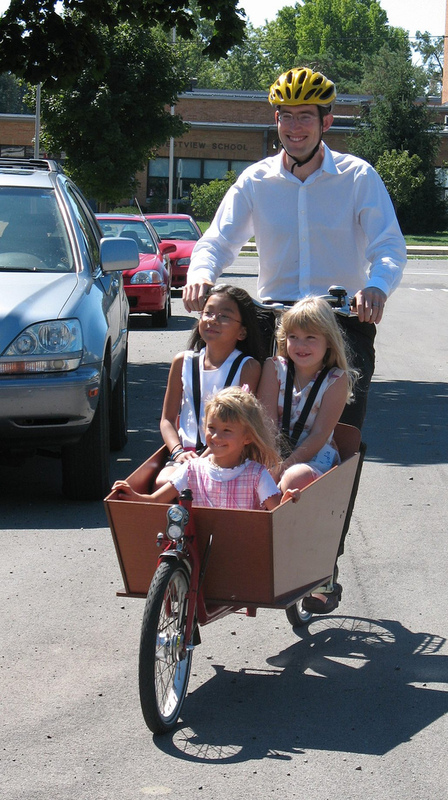 After church, I took a few children from the congregation on a ride around the block in the new bakfiets. The bike includes a bench seat and three-point harnesses for two kids. A second bench seat for a third passenger is an option that I passed on. A third or fourth child can ride on the rack behind the driver. You might wonder who far or how fast you can actually go when the bike is loaded. On this morning, I carried a full size adult two miles over gentle hills to church, averaging about 12 mph, which is not bad for a bike. The weight was probably comparable to these three kids. This fellow posted a video showing his three kids asleep in a bakfiets on a 25 mile ride, reporting that this solution works well for hauling the three kids up to about 30 miles (50 km). The kids in the video don’t have helmets on, which is the cultural norm in the Netherlands, where there are more bikes than people. They also have much lower bike fatality rates, despite a much lower percentage of helmet use. For a spirited debate about the helmet issue, see the mushrush.com/blogfat/archives/2007/04/to_the_lady_who.php and the comments that follow.